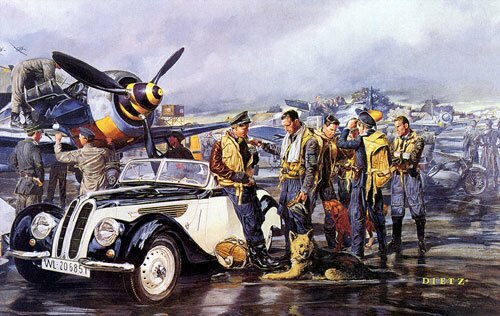 Image Size: 13" x 22" 500 Public Edition (Limited Edition, Signed and Numbered) 100 Artist Proof Edition (Limited Edition, Signed and Numbered) BMW 328, Focke-Wulf 190A James Dietz's grouping of planes, people and vehicles in "Tough Day" represents a bleak gathering of Jagdgeschwader 2's most colorful Focke-Wulf FW-190As. JG 2 "Richthofen" was one of the rare Luftwaffe units that campaigned in France from the first day of the 1940 Blitzkrieg to the end of the German occupation. While a Gruppe or Staffel might be sent elsewhere temporarily, JG2 was the stalwart fighter organization in the West. As such, JG2 was witness to the changes in Allied airpower. By the autumn of 1943 there was no question that Allied airpower was rising to unimaginable heights. The "Richthofen" pilots had battled the RAF in 1941, during the "Rhubarb" and "Circus" campaigns. In the Spring of 1942 the unit began a major conversion to the new FW-190, which provided a brief qualitative superiority in equipment. JG2 scored a huge tally of British aircraft during the Dieppe raid, but the RAF countered with more planes and new tactics in its fighter sweeps against the Luftwaffe. The very first missions of the American 8th Air Force were also flown in 1942. The wind was definitely blowing the wrong way for JG 2. New and better RAF fighters appeared in 1943, and the 8th Air Force's heavily armed P-47s and P-38s began ranging all over northern France. JG2 also faced the American heavy bombers that were targeting German air bases, as well as the missions flying overhead on their way to targets in Germany. The Jagdgeschwader reported almost two hundred pilots dead or missing in 1943, with a similar number of wounded. Three years earlier, the conquest of France and the Battle of Britain together had cost the unit 36 flyers. The automobile in the print, a BMW 328 is symbolic of a happier time in German engineering. The car was taken out of production early in the war as BMW began gearing up for massive manufacturing of the 801 radial engine for the FW-190. It remained a favorite of the top "experten" of the Luftwaffe throughout the rest of the war.